Has laid low throughout the pregnancy, got to know about it rather early on due to having gone through it all many times before. Knows her body, knows what it can and cannot handle and thus left the forest for more stress free environment that she found from home. The Silverine took her time slow, patiently feeding and growing, keeping her main focus on the little bean in her womb. She cannot help but to be fearful if she can still bear live children due to her age. Against her expectations everything has gone smoothly so far, feels the movements of the fawn regularly and from time to time wonders if there is more than one. Hopeful and happy. The silverine has enjoyed her pregnancy with her whole heart, full of love and hope. Made one visit to the forest during her gestation period, only to track down the father of the bean and tell him the news, delighted that the news were met with joy and happiness. As always does not expect much from the father, like is the way of her kind. • Her past hold many hidden secrets, some of them have been revealed as her residence here as been continued. Keeps to herself a lot. • Tends to hide her anger the best ways she can, even when furious she does not raise her voice. It is hard to make her angry in the first place. • She is a very heavy sleeper and would not wake up if a bomb exploded near her, also she snuffles quite a lot when she sleeps. • Tries to keep up positive thinking by searching something good in everyone, succeeds almost every time at that. Also will not show negative emotions easily. Smiles even when dying inside. • A real day dreamer at times, drifts off with her thoughts. • Does not want to let others down, does anything to prevent that from happening. She will take bullets for her closest ones. • Time and distance between her and her offspring mean nothing. They are always loved and cherished. • Is capable of feeling jealousy, very unlikely for her to show it. • Independent creature that does not need anyone by her side, deals with things well on her own. Does not submiss easily, it's probably the highest gesture you may get from her. • A wild being that is yet to be tamed. • Traumatized in many different ways by events and creatures from her past, those things has only made her mentally extremely strong and independent. • Does not want to be a second choise, prefers leaving the situation when she feels like being someone's second choise or if someone is settling for her company. • Seeks solitude from time to time. • During her life she has had to face countless fights in order to stay alive, due to that she has become very experienced fighter. • Was an experiment, very traumatic experience in so many ways. • Was taught that needing others is a sign of weakness, yet does not consider others weak if they ask for her help. This way of thinking is valid when she thinks about herself. • Very unlikely to adopt relations. More often takes a fawn under her care than adopts siblings. •Has adopted two sisters in the past. The bond between them cannot be broken and the depth of the bonds cannot be described by words. • Always longs for freedom, at times feels trapped in a rather small place like this forest. Unnatural for her to live in captivity. Serenity. Paradise. Motherhood. Strength & power. Patience. Family. Overcoming traumas. Will power. PTSD. Imperfection. Silk. Felines. Trientalis europaea. Limitlessness. Determination. Summer nights. Sea breeze. is greater than natural laws." they know they can survive." is often to be lonely." • Normal sized red deer hind, elegant and slender. Moves effortlessly and lightly. • Soft, silky fur colored in pure white, subtle rose colored spots here and there on her back and rump. • One visible scar on her left shoulder, a gun shot wound healed into a roundish scar. • Blood red eyes that turn into black whenever she is agitated or furious enough. • Sharp fangs hidden most of the time, appear when she wishes them to. • From time to time still wears a dark red ribbon around her muzzle, the ribbon has special qualities. To those who does not know it, it appears as a regular ribbon. • Her presence is calming and serene, she is in no hurry and takes the time to appreciate her company should she have some. • Gentle, welcoming look in her eyes. • Experienced in combat, a force to be reckoned with. Her slender body might fool one to think she is weak and frail. Kicks with power, bites to kill. • Fast runner, relies heavily on speed and swift movements in case she needs to flee. • Ruthless when fighting for her of for her loved ones life. A mother lioness. Joseph † Biological Father; The one she respected the most and looked up to. Warm and loving relationship. Rarely argued. Taught what is important, what to treasure, what to let go. Greatest rolemodel to her. Slaughtered by Jonathan. Forever bitter of. Forever missed. Sayaka † Biological Mother; The bond between the two was always warn and loving. 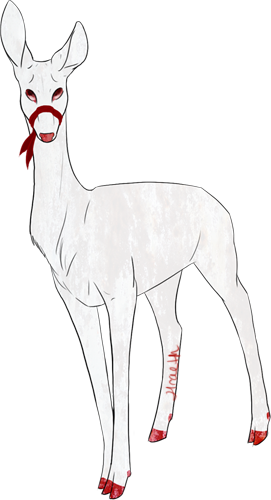 Sayaka's pride and joy as she was the daughter of the leader and as a hind from the lowest rank she was beyond ecstatic to give birth to a strong white fawn. The birth lifted Sayaka up on the ranking scale, leaving her in the middle cast of the group. Often thinks back on how her mother would handle a conflict, loves endlessly. Forever missed. Unrevealed Biological Sister; Sharing the same father the two grew close and tight all the way to the day when hell broke loose and everyone were forced to die. Or leave if they were sneaky enough to flee. Managed to flee and since had been watching The Silverine Hind from afar, letting her believe she died among the rest. Reunited in 2015 in the endless forest, however having to part ways as them being together was too much of a risk for both of them. There might still be someone out there wanting the last remains of the herd dead. Cherished bond, fearful of losing her for good. Loved. Jonathan † Former Partner, Father to Nicholas; Grew up together, shared her life with. First time had deep feelings for someone, feelings described as love. He killed their son and her father. Became obsessed with her and began to hunt her down killing everyone on his way. Loathed him for what he had done. Killed by The Red. Ehrune Former Partner, Father to Rae and Poika; What she thought was a dream come true turned out to be a nightmare as their views of their relationship were not on the same level. Was taken on a massive guilt trip by the male where her selfesteem and self value sunk too deep for her to handle. The bull is still very much loved and cherished with only good memories in her mind. However feels better and more like herself now that they have parted ways. Respected and adored. 12.10.2012-28.4.2015. Nicholas Biological Son; First born son. 2008. Once killed by Jonathan leaving the hind shattered and broken, the tiny fawn ended up spending years and years in limbo. Returned years later in the form in which he was killed. Unwilling to let anyone harm him, will protect him with her life. Incapable of losing him again, highly treasured. Grown into a fine stag taking his own paths in life, sees a lot of same traits in him that she once saw in his father, both good and bad. Kajo Biological Son; Second born son, first one to be born in the forest. 2011. Fathered by The Red. At first unsure how to handle another fawn. After countless ups and downs she gave birth to him. The most treasured creature in the world. Protects with her life and soul. Extremely proud of her baby boy. Sometimes forgets he is all grown up, misses greatly. Often visits him in Scotland. Naara † Biological Daughter; Third offspring. 2012. Miscarried due to massive mental stress and a series of nervous breakdowns. Every day wonders what she would have been like. Father unknown, Forever bitter for this. Eventually got to the place where she can accept her loss and name her lost child. Rae Biological Daughter; Fourth offspring, Her little baby girl.2013. Fathered by Ehrune Proud of how strong she has become and what a great mother she is as she takes many helpless fawns under her wing and gives them a chance to live and grow. Amused by how much she reminds her of herself. Likely to be fiercely, brutally protective of. Not to be touched Her first born daughter. Poika Biological Son; Fifth offspring, third born son. 2014. Fathered by Ehrune. Shares a deep rooted connection due to getting to know him before giving birth to him and being possessed by him. Dangerously protective and possessive of. Rohan Biological Son; Sixth offspring. 2015. Fathered by The Red. Treasure. Slowly allowing the fawn to discover on his own, keeping an eye on from the distance. Worries often for his overly curious nature. Treasure. Rhona † Biological Daughter; Seventh offspring. 2015. Fathered by The Red. Precious. Slowly allowing the fawn to discover on her own, keeping an eye on from the distance. Treasure. As of months now she has been struggling with the well being of her daughter, being pushed away, lied and yelled at, being blamed for everything wrong with her life she has absolutely no clue of what she should be doing. Loves her to bits and yet finds it so incredibly hard to love her while Rhona does everything to make her stop loving her daughter. Wishes for the best for her, but has mentally prepared herself for the worst. Deceassed on the 3rd of October 2016. Heartbroken. Source of bitterness. Svolnir Biological Son; Eighth offspring. 2016. Fathered by Ehrune. Her evening star, her one last child. Protected with all she's got, fiercely and brutally protective of. ?? Biological ? ; Nineth offspring. 2019. Fathered by Eldridge. Accident, bringer of joy. ?? Biological ? ; Tenth offspring. 2019. Fathered by Eldridge. Accident, bringer of life. Starling Non-Biological Sister; Best friend. As time went by those two grew more close to each other. Highly respected. Owes her life to. Without Starling Kauna would not be here anymore, forever thankful. Would protect with her life no matter the situation. Forever loyal, Inseparable. Waarhijd Non-Biological Sister; Best friend. Touched deeply by the black butterfly. Would keep the doe safe at all costs. Has always been able to go to her when needed a shoulder to cry on or anything else she can think of. Loyal until the very end. Nat-Nat Non-Biological Daughter; Very special to her, very high motherly tendencies around the ghost. Would protect her at all costs. Treasures. Treats as if she was her own blood. Loves ever so deeply even though time has come between them and they don't see each other so often anymore. Neah Non-Biological Daughter; Delicate little flower. Kauna fell in love with the little one immediately when she found her. Took her under her wing and raised her as one of her own. Would have done anything in her power to protect her and keep her happy. Fiercely protective of. Living her life in another forest, wishes to find her way to visit her. Liam Biological Grandson; 2013. Proud to call him her grandson, ready to help him with anything and everything. There is something in him that she has once known. Living in Scotland, visits him every now and again. Son to Kajo. Herne Biological Grandson; 2014. Source of pride and hope. Son to Kajo. Naomh † Biological Granddaughter, fathered by Nicholas. Born as a stillborn, great tragedy to both her and her son as his first and only fawn was a stillborn. Forever missed and wondered how she would have been, what she would have looked and where the life would have taken her. Nilo Biological Grandson. Mothered by Rae. 2013. Extremely protective of. Watches over from the distance as he has grown up. Worries greatly now that he has gone missing. Assumed deceased. Aina Biological Granddaughter, mothered by Rae. 2013. Extremely protective of. Has witnessed her strength and will countless times, knowing she will pull through anything. Has noticed her isolate herself from the rest of the family, often seeks out and encourages to go out there and enjoy some family time. Notus Noel Biological Grandson, mothered by Rae. 2014. Watched over when mother was not around. Cherished. Luso Lavien Biological Grandson, mothered by Rae. 2014. Saw a bit less compared to his brother Notus, but watched over nevertheless. Cherished. Raelle Biological Granddaughter, mothered by Rae. 2016. Will do all in her power to keep safe. Not to be harmed. Ronja Biological Granddaugter, mothered by Rae. 2016. Will do all in her power to keep safe. Not to be harmed. Faolan Biological Grandson, mothered by Rae. 2016. Feeling a somewhat odd bond with the crippled fawn. Will do all in her power to keep safe. Not to be harmed. Lyre Biological Granddaughter, mothered by Rae. 2017. Latest addition to the family, blinded by the beauty the little one holds. Not to be harmed, will be protected with everything she has. Vrath Biological Grandson, from Rhona. 2017. Questions her decision to abandon her own son but does not judge her for this. Watches from afar, hoping to see him bloom. Dying inside as she cannot represent her as his grandmother, loves the child to bits. Dalaigh> Biological Grandson, fathered by Rohan. 2016. Only got to know him when he was already a yearling, high hopes for the boy. Daimhin Biological Granddaughter, fathered by Rohan. 2016. Only got to know her when she was a yearling, twin to Dalaigh. High hopes for the girl. Sasuda Biological Great grandson, mothered by Aina. 2016. Will do all in her power to keep safe. Not to be harmed. Adler Biological Great grandson, fathered by Nilo. 2016. Not to be harmed. HawthornGreat grandson, fathered by Nilo. 2016. Not to be harmed. Locust Great granddaughter, fathered by Nilo. 2016. Not to be harmed. Ren Great grandson, fathered by Nilo. 2016. Not to be harmed. Lamia Great grandson, fathered by Nilo. 2016. Not to be harmed. Raja Great granddaughter, from Ronja. Not to be touched. Protege. 2018. The Red † Father to Kajo; First one to meet when entering the forest and since the day he has been a highly respected and valued relation. A hero in her eyes after killing the one who wanted to slaughter her. Time and distance apart had an effect on their relationship and is still trying to rekindle with him but the success has been very little as she finds herself navigating away from the stag more and more each day. Unease in his company. Auxentius Former Nest Leader; Close Friend. She was a part of his nest. Holds great respect towards. Shocked to see the owl leave the forest. Nevertheless, has a place in her heart. Gone. Little GoatUnspoken Daughter-figure; A sweet child she watched to grow up. Still, feels motherly around her and is more than willing to take care of her. Fell in love with at the first sight, fiercely protective of. Hasn't seen in a while, misses. Ella Charge; Daughter to Eórra and Ehrune. Has watched her grow ever since she was born, the one of the triplets that has stuck around the most. Has protected her no matter what. Proud of. Seen as one of her own due to the fawns constant presence and sticking to her during her fawnhood. Eorlien Charge; Daughter to Eórra. Proud of the doe she has begun. Time and distance does not break the bond, always loved. Sevigne Charge; Daughter to Maria. Has taken the little fawn under her watchful eye, feeds her if need be. Often worries for her being so fragile but knows even the small ones can grow strong. Family. Deceassed on the 27th of August 2016. Resurrected. Gwlithlys Charge; Like one of her own. Fierce little thing filled with energy. Family. A sight for sore eyes, and what a beautiful thing she's grown into. Cedrelya Unspoken Daughter-figure; Has somewhat deep motherly tendencies around the doe, even though she is already a young doe. Holds very close to her heart and would do anything to protect her if needed. Will be by her side no matter the time or place. Gone? Achilles Son-in-law. Loved and cherished, forever thankful for protecting his family from disaster. Knows she can trust the buck. Djinn Confidant, close friend. Over time grew great trust towards the brown doe. Considered family and a part of the herd. Highly protective of even though knows the doe can very well protect herself. Admiration. Adoration. Developed to be one of the only few she would trust her life to. Saosin † Source of great hatred, heartbreak and bitterness. Abused, manipulated and got her daughter pregnant without her suspecting a thing as he was one to help her raise her. The Silverine is unable to understand the entire concept of the abuse and most likely will keep her mind out of it for her own sanity's sake. The inferno found a way to turn the usually forgiving and understanding hind into a bloodthirsty, merciless Lion Mother. All the respect she once held for him is far gone and buried with her child's corpse. •Date of birth unknown, born into a large herd. Daughter of the leader. • Grew up and partnered up with a stag named Jonathan. • Had her first fawn at very young age. • Named the fawn Nicholas, who soon was murdered by Jonathan. • Massacre. Escaped the herd to survive, fled from the monster. •Met Virgil, Starling, Waarhijd and Auxentius. •The nest was formed, her being the leading female. Tight group. •First rut soon arrived, got pregnant with Kajo. Fathered by Virgil. • Found out Jonathan had killed nearly everyone in the herd, her father included. Revealed secret. •Worn out and ready to give up, faced another challenge when she found out she was carrying a fawn of some unknown male who had wronged her. Unpleasant memory. •Miscarried the fawn. After years of dealing with the events managed to name the fawn Naara. •Soon Jonathan found his way to the forest, he was after the last surviving herd member. Face the death. •Managed to get away from him for a while, fought him until she was unconscious. •Was dragged away from the forest but managed to leave her ribbon behind. •Jonathan left her suffer and die, her time was running out. Starling learnt how to use the ribbon and managed to get to her on time. Saving her life. •After all she had gone through and survived she was told that she had been an experiment. Revealed secret. •Worried over Kajo's absence nearly assuming him deceased. Was proven wrong as the prince returned home. Good memory. •Life became brighter again, enjoyed her days. •Auxentius left the forest leaving the nest without a leader. Trying to be there for Starling who had the most difficult time accepting it. •Next rut was here, met countless of new faces, including Ehrune. •Made it difficult for him but ended up falling for him. •A dear friend passed away, leaving Kauna unbalanced. Massive loss. •Got pregnant with Rae by Ehrune. •Learnt there were more fawns fathered by Ehrune and did not take it well. •Butted heads with Ehrune countless times before they became exclusive, partners. •Gave birth to Rae in the birch forest taking that certain area as her second hiding place. •Made her best to be there for Rae, was absent some parts of her fawnhood. •Met Liam, her first grandson through Kajo. •Took him under her wing and showed her around. •Became pregnant with Poika when Rae was almost a grown up. •Deep rooted bond with Poika before he was even born, bonded with while he was in her womb. •Liam moved back to his homeland, stayed there ever since. •Personality changed as Poika grew inside of her and got brutally protective of her belly and unborn son. •Isolated herself from others, did everything Poika was telling her to do. •Lashed out at Rae who ended up breaking the connection between Kauna and Poika, leaving them with a rather normal mother-son relationship. •The bond between the mother and the child could never be broken for good. •Learnt that Rae was pregnant with Achilles' fawns. •Wasn't pleased but promised to help her if she needed, congratulated her. •Rae gave birth to twins, Aina and Nilo. Got her first granddaughter and second grandson. •Watched the youngsters grow, Nilo being colorblind and Aina being haunted by Segolia. •Worried for both, always watching them from the distance. •Was told that Achilles needed to go see Thanatos in Hell to save his fawns. •Promised to watch over Aina and Rae while he and Nilo went down to fight. Allowed her granddaughter fight her own battles. •Alongside Rae took care of Aina and the boys after the fight, unsure if they would make it. •Everyone was back in their feet again, pleased and happy. •Ran into an old friend who had passed away. Couldn't believe her eyes. •Performed a rather risky and difficult operation as she removed the bullet from The Red's shoulder with the help of Saosin. •Witnessed Rae give birth to another twins, identical baby boys. •Congratulated the parents, knowing they would do well. •Left to fill up another promise she had made not long ago, went to see The Red in Scotland. • Got pregnant before the rut in the Forest began. • Parted ways with Ehrune in the end of April 2015. • Gave birth to Rohan and Rhona in her homelands. • Reunited with her sister after spending years apart. • During the rut 2015 handed the throne to her daughter, Rae. • Remains as the Matriarch, helping her daughter to run the herd from afar. • Got pregnant during the rut once more from Ehrune. • Left to her homelands to gain weight and get in touch with her roots once more. • Witnessed her granddaughter give birth to Sasuda, her first great grandchild. • Got shot in her homelands leaving her in poor condition and a permanent limp. • Witnessed the death of her daughter, Rhona, and was informed of the events leading to it. Breaking ties with The Inferno and everyone supporting him. Experiencing the greatest hatred she ever had before. • Birth of her grandson Vrath. • Growing old, lonely and bitter. Suicidal for the first time in her life. !Viewer discretion is adviced. Mature content. Kauna is IC. Does not represent her player. Character (c) Me | Art (c) Tuhka/Ratt | Codes (c) Salome, edited by me | Discord: Kaunako#2487!